Increases in arterial stiffness and pulse pressure are typical features of the arterial stiffness during aging and are associated with increased risk of cardiovascular complications. 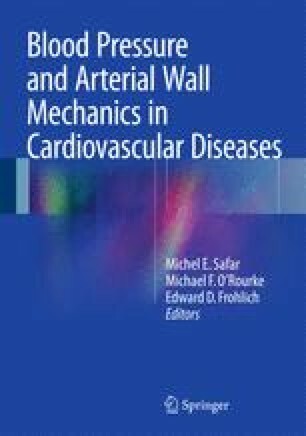 Cellular and molecular determinants of arterial stiffness have not been completely elucidated. Clinically, the carotid-femoral pulse wave velocity (PWV) is the gold standard parameter of arterial stiffness. A recent genome-wide scan of the Framingham Heart Study population has shown that arterial stiffness and mean and pulsatile components of blood pressure are heritable and map to separate the genetic loci in humans, suggesting that distinct genes may modulate these two phenotypes. This chapter details the recent knowledge on the influence of genetic determinants and telomere length on the development of age-related phenotypes. Recent genetic studies have revealed specific genes contributing to arterial stiffening. Available data on genome-wide association (GWA) have been initiated on PWV and have identified common genetic variation in specific loci or single-nucleotide polymorphisms (SNP) significantly associated with PWV. Telomere length at birth is strongly determined genetically and is the main determinant of leukocytes’ telomere length (LTL) later in life. Short LTL is associated with increased risk of stiffness and atherosclerosis of the carotid artery, atherosclerotic heart disease, and diminished survival in the elderly.